Nightclub Flyers is rated 3.9 out of 5 by 10. Rated 5 out of 5 by rahstutts from Great quality Effecient with order and I like the quality of the work that was completed. Rated 5 out of 5 by slocal events from Thank you for the flyers! Good quality and pretty fast shipping! Thank you!! Rated 4 out of 5 by Hookz from Easy to use, and good customer service. The Title "48" hours is a little misleading, but after communicating with the company i was able to get my product delivered on time. Nightclub flyers let patrons know what’s hot on the social scene and on the schedule. And you can trust 48HourPrint.com for hot-looking nightclub flyer printing that attracts a crowd. Our online nightclub flyer printing service gives you high quality nightclub flyer printing at very affordable prices. And you also get the benefit of our industry-leading 48-Hour Turnaround Time Guarantee. Nightclub flyer printing lets you spread the word about upcoming acts and events. Be creative and use full color nightclub flyers to attraction attention and build an audience. Patrons will be eager to see what is going on at your club. Choose from card-size club flyers to half-sheet club flyers for handing out or posting. Nightclub flyer printing gives you scores of cool promotional opportunities for activities and events. 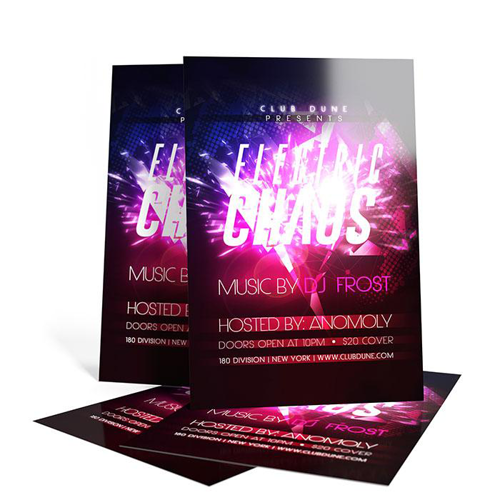 For promotional tips on using nightclub flyers, check out our nightclub flyer marketing ideas. Also review our nightclub flyer templates for layout guidelines that will help keep your print job on schedule.